The Highway Mysteries have introduced a unique new character for mystery lovers, especially fans of the ‘whodunit’. The hero, Hunter Rayne, is a retired homicide detective who left a successful career with the Royal Canadian Mounted Police to become a long-haul truck driver. Why a man would do that is a mystery in itself, but it’s no mystery that his sense of justice compels him to help solve crimes that affect people he cares about. In a genre that already has plenty of tough-talking North American homicide cops, brilliant Scotland Yard detectives and smart aleck private eyes, this polite and low-key Canadian truck driver has a niche all to himself. He has adopted a solitary profession by choice, is struggling to pay the bills just like the rest of us, and isn’t very good at personal relationships, but when it comes to solving murders, he’s a smart and seasoned detective. Write what you know, they say. By 1994 I’d spent around twenty years working in the transportation industry. My husband had once done undercover work for the police and had used a truck driver as his cover. Truck drivers can show up just about anywhere without raising suspicion, and they aren’t limited to one geographical area. All of these factors combined to make a long-haul trucker the hero of choice for my mystery series. As much as Hunter Rayne tries to keep his new life simple and uncomplicated, circumstances, with the help of his boss, Elspeth Watson, conspire to get him involved in murder investigations even in his civilian life. As a boy, his heroes were cowboy crusaders like Roy Rogers and the Lone Ranger, and he just can’t seem to let go of what motivated him to become a law officer in the first place, that need to see the guilty party captured and justice done. The Highway Mysteries aren’t thrillers or full of heart pounding suspense, but they will keep you guessing. 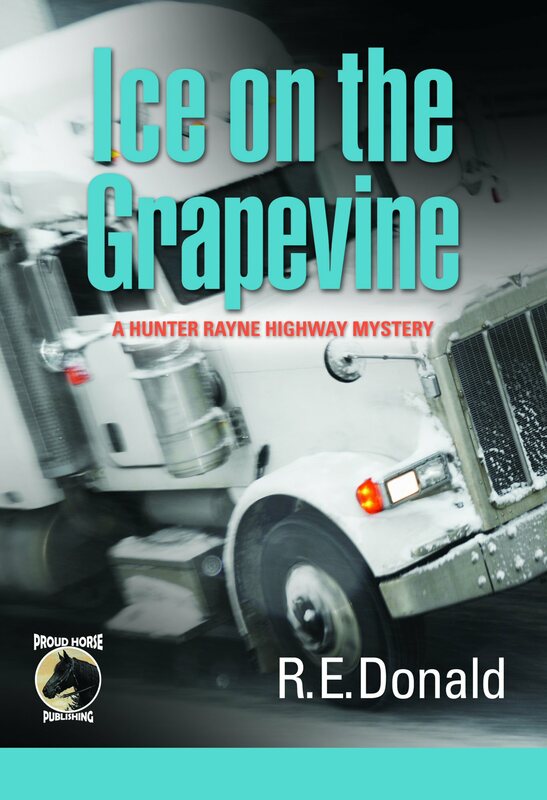 The second novel in the series, Ice on the Grapevine was a finalist for the 2012 Global Ebook Award in Mystery Fiction. The novels are available in both print and digital editions. They’re available online from Amazon, Barnes & Noble, and other sites, or from Proud Horse Publishing, or you can ask your local bookstore to order them. Just quote the ISBN numbers. “The dialogue is well written and smooth and without giving away any spoilers there are well thought out and believable twists. The pacing is good and the lead characters are likable, flaws and all, and though I haven’t read the first book in the series I now want to and look forward to reading more in the future. I highly recommend Ice On The Grapevine as a good read and a solid example of good writing. Plus, and this is probably most important, it is a fun ride.” See Goodreads review. 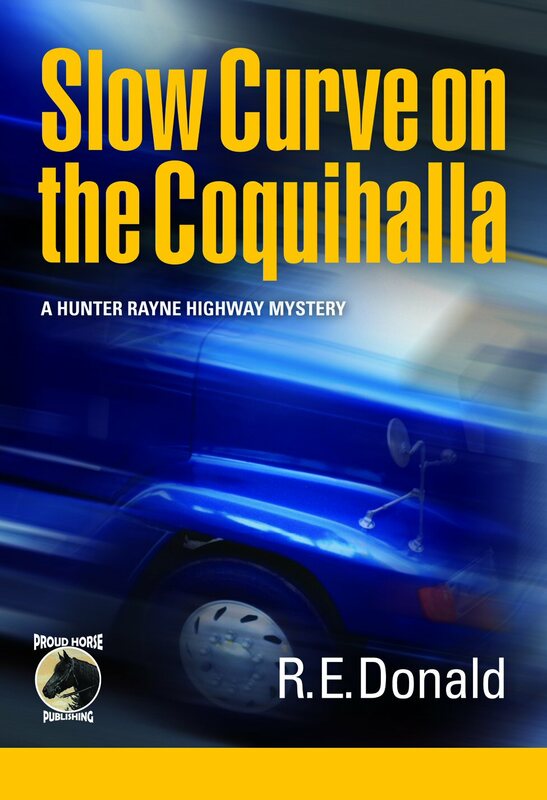 The ISBN for Slow Curve on the Coquihalla is 978-0-9881118-06. The ISBN for Ice on the Grapevine is 978-0-9881118-13. During what was supposed to be a few days of skiing at the Whistler Mountain resort with an attractive female acquaintance, former homicide detective Hunter Rayne finds himself the prime suspect in the RCMP’s hunt for “The Chairlift Killer”. Hunter has no choice but to get involved in the investigation in order to clear his name. Meanwhile, trucker Hunter was scheduled to haul a load of freight to Northern California, so he calls up his old friend, biker Dan Sorenson, to take his place behind the wheel. What connects the badass biker from Yreka, California to the most prolific female serial killer in US history? And what happens when dispatcher El Watson ignores Hunter’s warning and sends the biker on a search for clues to the motive behind the murder? The ISBN for Sea to Sky (print edition) is 978-0-9881118-20. The fourth novel in the series is titled Sundown on Top of the World and is scheduled for release early in 2015. I hope you enjoy reading about my truck driver hero as much as I enjoy writing about him! Like my page on Facebook or follow @RuthEDonald on Twitter for updates. Tags: barnes and noble, British Columbia, Canada, criime novel, kindle, kobo, murder mystery, mystery, truck | Permalink.